The City Chapter will hold an evening of poetry on Thursday 4 October 2018 at 7.30pm in Armagh City Library, Market Street, Armagh. This event will celebrate National Poetry Day with poets Gráinne Tobin and Mel McMahon. 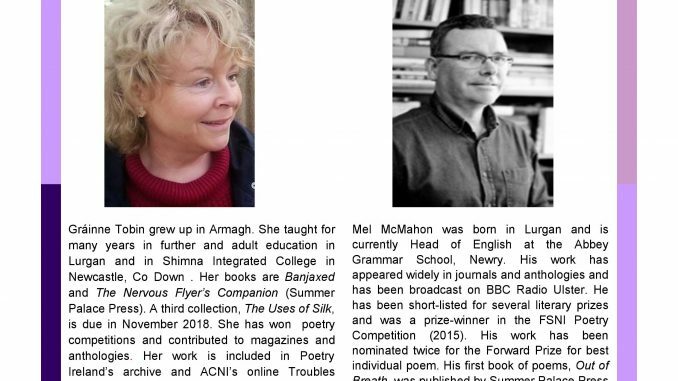 Both poets are known to local people and it is hoped that there will be a good audience so that National Poetry Day may be well celebrated in Armagh. Organised by the partnership of libraries in Armagh, the City Chapter publicly thanks the John Hewitt Society for the continued financial support which it gives for this annual event. Gráinne Tobin grew up in Armagh as the eldest of a large family. She taught for many years in further and adult education in Lurgan and in Shimna Integrated College in Newcastle, County Down where she lives. Her books are Banjaxed and The Nervous Flyer’s Companion (Summer Palace Press). A third collection, The Uses of Silk, is due out in November 2018 from Arlen House. Gráinne has won poetry competitions and contributed to magazines and anthologies, including Word of Mouth (Blackstaff), When the Neva Rushes Backwards (Lagan Press), On the Grass When I Arrive (Liberties Press), Washing Windows (Arlen House) and Something About Home (Geographies Publications). Her work is included in Poetry Ireland’s archive and the Arts Council of Northern Ireland’s online Troubles Archive, and one of her poems is on permanent display as a public sculpture. Mel McMahon was born in Lurgan in 1968. His work has appeared widely in journals and anthologies and has been broadcast on BBC Radio Ulster. Mel has been short-listed for several literary prizes and was a prize-winner in the FSNI Poetry Competition (2015). His work has been nominated twice for the Forward Prize for best individual poem and his first book of poems, Out of Breath, was published by Summer Palace Press in 2016. He is currently Head of English at the Abbey Grammar School, Newry. His second book of poems, Beneath Our Feet, published in 2018, is an exploration of the last few years of war poet, Wilfred Owen’s short life. Members of the City Chapter invite people to come along to hear Gráinne and Mel read their poetry. While National Poetry Day has the theme of ‘change’ this year, this special day will always wish to celebrate poetry’s power to bring people together. Admission to the event is free with donations greatly needed and appreciated for the City Chapter.